Our school accommodates children of all races, gender and families of any faith as long as these families honestly seek and support the educational program and expression of the Catholic faith. We accept children with special needs if our facility and staff can accommodate their needs. We are able to do this through our SPICE (Special People in Catholic Education) program. The special funding helps the school to be able to offer special education services and gifted and talented services to the children of our school. We also offer tutoring services during the school day for those students who may, at any given time, be struggling in a particular area. We offer the finest in technology with a computer lab, computers and interactive TVs in every classroom, and a rolling cart of laptops and iPads. We have a technology coordinator who instructs the students in computer basics and works with the classroom teachers on special projects. 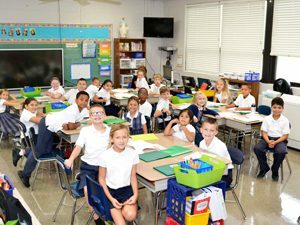 St. Cecilia School was the first Catholic School in the Columbus Diocese to receive OCSAA accreditation. We also received the Doyle Memorial Fund Award in the 2004-2005 school year. This award was given in recognition of our work with children with special needs. We also received the Buckeye Healthy Schools Gold Award in 2005-2006 for our work in keeping our children healthy in our lunch program and physical education program.